Thank you for the newest one!!!! LP comes in 2 different covers - the SYNDROME-Cover and the ANTIDROME-Cover, both versions are lim.num. 250 cop. plus download code. The cassette cover is different to the LP artwork, lim.num. 200 copies and has no download-code! All indicators point in one direction. Starting at "Hellstation" towards "Zone 0", passing buildings whose true purpose is less based on functionality than on degeneration. To degenerate the population, painting them pictures of would could but never will be. Concrete ravines, which are not made to live in, much more to delineate. The cries of the "Prekariat" drowned with the play and song of the theatres. A city as you find it everywhere, marked by the pleasures of the people, covered by wishful thinking, yet full of Babylonian arrogance. From here to there, from the "Flesh Supply Center" to the forensic psychiatry. And here and there a man rises up and connects with his kind. A Forensic Resistance. 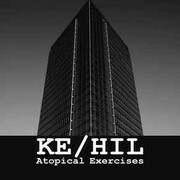 Follow "Ke / Hil" on their way through ruins that no one sees - hear screams no one hears - exist! , so no one else does. "Syndromes / Antidromes" rattles at the societies "Comfort-zone" - Is this really Ke/Hil ? play it loud to hear the extreme cold! Starting at "Hellstation" towards "Zone 0", passing buildings whose true purpose is less based on functionality than on degeneration. Concrete ravines, which are not made to live in, much more to delineate. The cries of the "Prekariat" drowned with the play and song of the theatres. A city as you find it everywhere, marked by the pleasures of the people, covered by wishful thinking, yet full of Babylonian arrogance. From here to there, from the "Flesh Supply Center" to the forensic psychiatry. Follow "Ke / Hil" on their way through ruins that no one sees - hear screams no one hears - exist! , so no one else does. "Syndromes / Antidromes" rattles at the societies "Comfort-zone" - Is this really Ke/Hil ?